Trying to do bbq chicken tikka kebabs on a traditional grill has always been problematic because the grill doesn’t compare well with the high temperatures encountered that one can achieve in the Indian tandoor. Use a kamado ceramic barbecue however and your problem is solved. Just like cooking in a clay tandoor the design of the kamado ceramic barbecue is ideal for vertically resting kebab skewers inside and the heat that a kamado can generate ensures that we get that crispness to the exterior of the chicken so keeping the juices inside. I did these in a Big Green Egg but it's even easier to do in a kamado that has a split heat deflector stone because you can use the support frame to rest your skewers on. 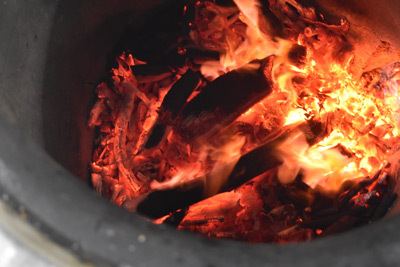 I do this on the my Monolith by using the charcoal basket divider to create a fire in one side. I then insert the frame that supports the heat deflector stones and then place the skewers vertically into the side of the basket with no fire, resting the handles on the frame above. Whether you have a charcoal basket of cast iron grill grate, you still have to be careful to stop the skewers sliding through the holes in the grate. When I was on a recent trip to India my chef taught me a neet trick which serves both to stop this happening and the keep the meat on the skewer - place a chunk of potato on the tip of the skewer. 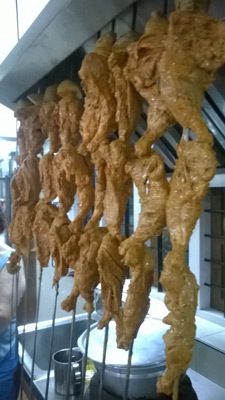 It's difficult to see but this is what has been done with these kebabs. This recipe also calls for a minimum 24 hour marinade (preferably 48 hours) so you’ll need to think ahead. Long metal skewers (no plastic or wooden handles) will be required and heat resistant gloves too. For me it has to be thigh meat, it's so under-rated. Agreed it doesn't look a nice as breast meat but it's so much more juicy and flavorful. In this recipe I've boned out the thighs and removed the skin - essential to ensure that your marinade can work on all areas of the meat. There are no allergens in this chicken tikka recipe and there may just be a super food in the shape of curcumin (the yellow pigment found in turmeric). A number of studies have been done on the medicinal properties of curcumin. You can read more on this nutritional facts website. Pop the peeled onions, garlic and chillies into a food processor and blitz until they form a rough paste, add the remaining ingredients and mix again thoroughly and the marinade is done. Place the chicken thighs into the marinade, cover with stretch wrap and refrigerate for 24 to 48 hours. Remove the grill plate and get the kamado well cranked up to about 300°C or 600°F and then thread a whole chicken thigh onto an individual skewer, threading it right up to the handle. Using heat resistant gloves, place the skewer tips in the hot charcoal and rest the skewers vertically on the inside of the kamado. Cook for 10 minutes and you’ll have bbq chicken tikka kebabs to die for. 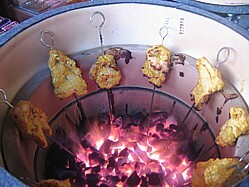 Serve up with naan bread and cucumber raita and marvel at the versatility of your kamado ceramic tandoor.